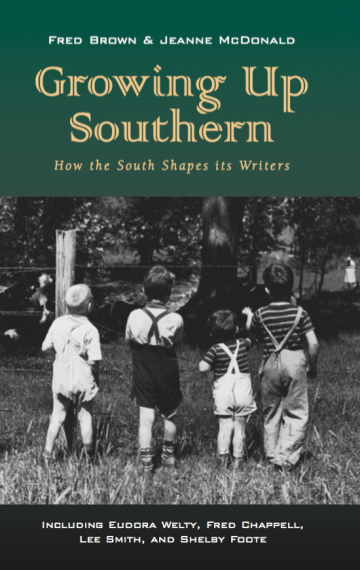 The profiles of the thirteen southern writers in this book show how growing up in the South shaped their work and contributed to the estimable collection of literature we call “southern writing.” For years, critics have attempted to analyze and define “southern” literature. The patterns that emerge through these interviews offer clues to that diversity through the cultural, economic, and social experiences of the writers. The writers represented here, all born in the first half of the Twentieth Century, are Shelby Foote, Eudora Welty, Lee Smith, Fred Chappell, Elizabeth Spencer, Richard Marius, George Garrett, Jayne Anne Phillips, Elizabeth Cox, Allen Wier, Willie Morris, Yusef Komunyakaa, and Doris Betts. Their work reflects a unique view of an Old South that slowly began to evolve into a landscape dotted with shopping malls and criss-crossed with interstate highways. But in their stories and novels they have pre- served the best of the old, insulated towns they grew up in, as well as the worst of the conflicts southerners of all colors endured. FRED BROWN, feature writer with the Knoxville News-Sentinel, has been a journalist for over thirty years. He is a member of the Scripps Howard Hall of Fame and a recipient of both the Malcolm Law Trophy for Feature Writing and a National Endowment for the Humanities Fellowship at the University of Michigan. He has published both fiction and nonfiction. His wife and co-author, JEANNE MCDONALD, is the author of a novel, Water Dreams, and has published short fiction in anthologies, magazines, and journals. She is the recipient of the Tennessee Arts Commission/Alex Haley Fiction Fellowship. Brown and McDonald, who live in Knoxville, Tennessee, are also co-authors of The Serpent Handlers: Three Families and Their Faith, which was awarded the Harry Caudill Prize for Journalistic Reporting in 2000.